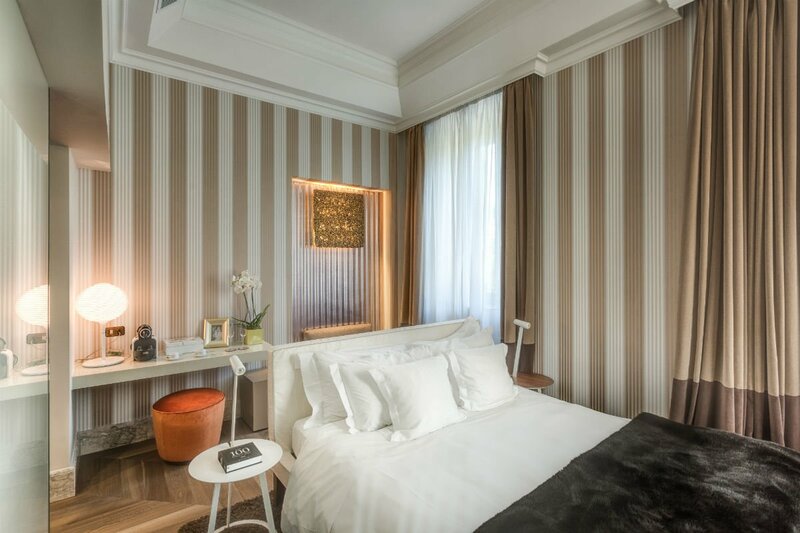 Five-star boutique hotel Palazzo Manfredi was built in the 17th century, located in the heart of what was once Imperial Rome. 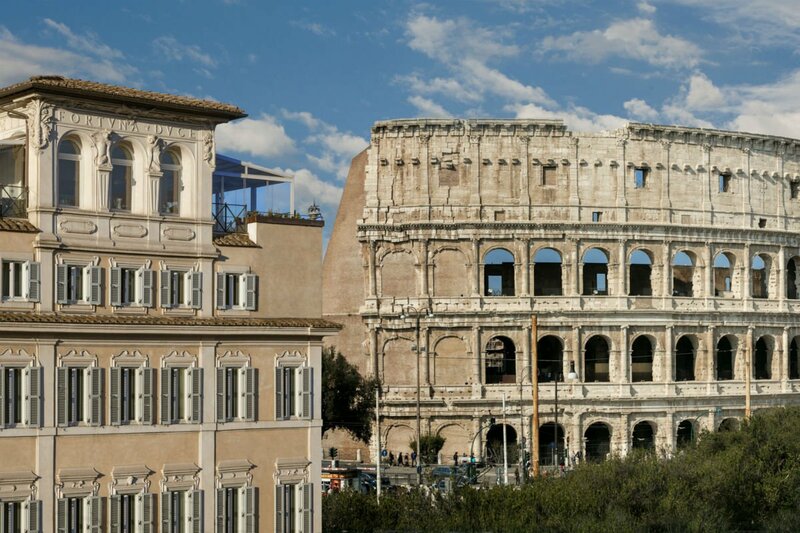 The hotel's location is the hook for history buffs, as the hotel is surrounded by ancient Roman buildings and is a stone's throw from the insanely iconic Colosseum. The views are, simply put, unparalleled. Guests are afforded a clear view from their bedroom suites as well as the terrific rooftop restaurant, Aroma. Vibe: Elegant but small and intimate. There are incredible views from each room, framed in a classically Italian way (sumptuous drapes, elegant wallpaper) without being fusty. Breakfast is served on the roof with panoramic city views. Even though the area is touristy, you’ll feel above the fray while still having incredible access to historical sites. 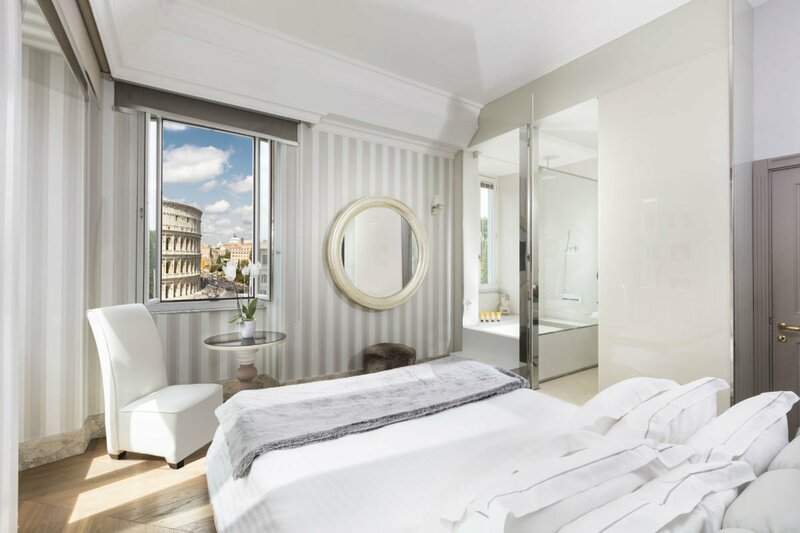 Standout Detail: Built above the ruins of Ludus Mangus (the gymnasium used for training by Roman gladiators), the hotel has a crazy perfect view of the Colosseum as well as stately Cyprus trees and hilltop greenery. This Place Is Perfect For: A sophisticated retreat for sightseers (and even their children). 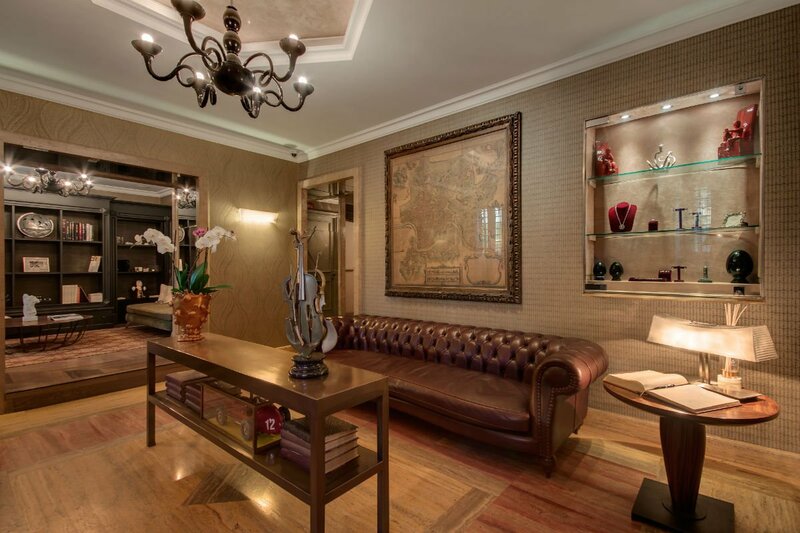 The lobby at Palazzo Manfredi. Rooms: There are twelve rooms, two suites, and six apartments decorated with neutral hues, contemporary furnishings, upholstered headboards withplush bedding, Acqua di Parma toiletries, and those million-dollar views. There's complimentary WiFi, every room is fit with a flat screen TV, and housekeeping comes twice a day. 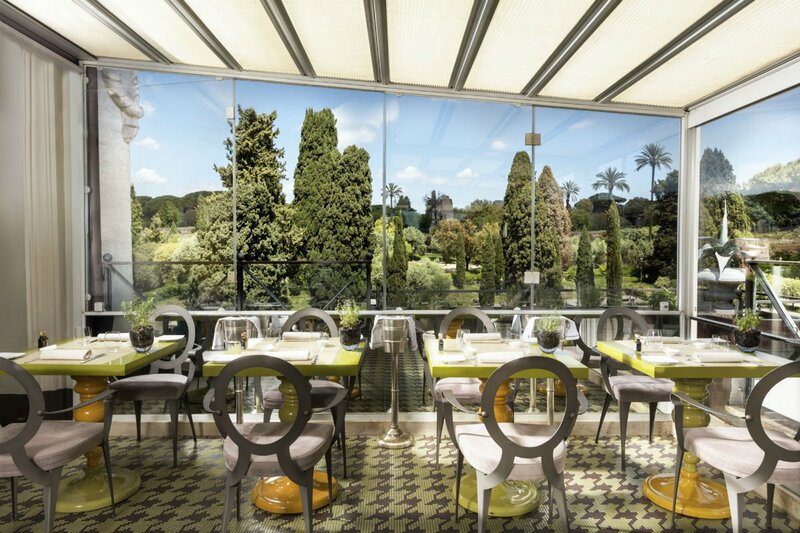 On Site: The restaurant at the hotel is a must see, as it has the best view of the Colosseum. (Repetition of its proximity to the Colosseum is necessary.) A little lounge in the lobby makes for a perfect place to enjoy an aperitivo. Do you need a transfer to or from the airport? Or would you like to take a drive around town? The hotel would be thrilled to set you up with a tony Mercedes or the house Lamborghini. Food and Drink: Sip a Campari in the bar that looks out at Parco di Traiano. 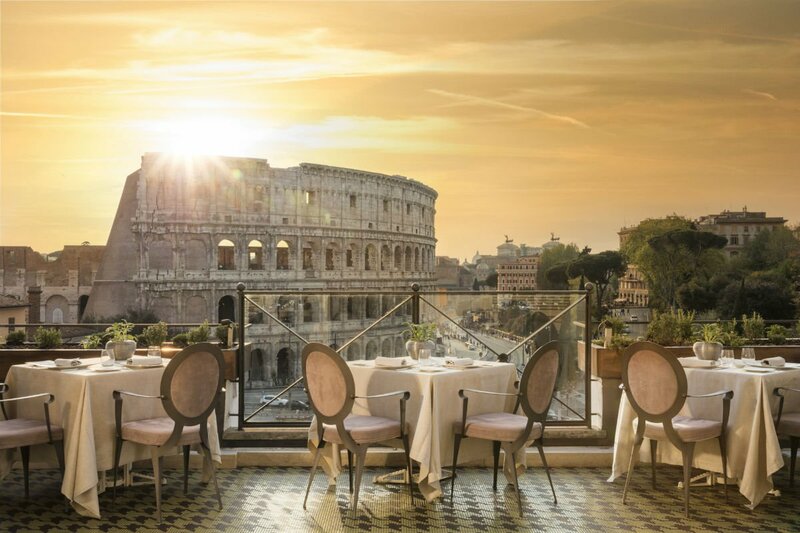 At the rooftop formal restaurant Aroma, Modern Roman is delicately prepared and plated by the creative Michelin star chef Giuseppe Di Iorio — think handmade pasta, marinated tuna, rabbit saddle, fennel fondue. The Bistro serves full breakfast and quick-and-chic bites on the covered terrace a nice touch in a town that usually considers the morning meal to mean an espresso and brioche. Rates change seasonally and typically start at $670 depending on the room type. Click here for reservations. Or get in touch with the Fathom Travel Desk, and we can plan your trip for you. The surrounding area is rich with sites, museums, and cafes. The Colosseum is only steps away from the entrance, the Pantheon and the Trevi Fountain are a 20-minute walk. The Baths of Caracalla, Italy’s second oldest Roman public baths, are located nearby and worth checking out. Bike across the Tiber river (its close) and explore Trastevere, an edgy neighborhood with little wine bars and marketplaces — it’s also ideal for night time as most bars there are open late. Bar Del Fico, located in the near by Piazza del Fico, is ideal for drinks and Trimani Wine Bar is the perfect place to grab a classic Roman snack. The bohemian Monti neighborhood is also right up the street. Wind your way through the cobblestones and washed pink houses, stopping into independent boutiques, coffee shops, juice bars, and trattorias. It's the perfect place to explore once you’ve had your fill of the historical sites and want to act like you’re a local.